- Formula 1: The biggest event of the year! 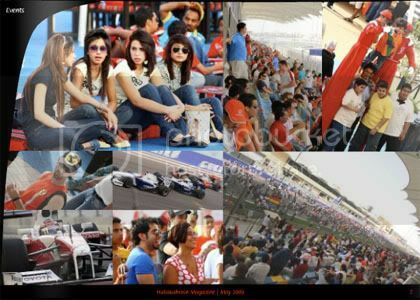 Bahrain fills up with people from all corners of the World, here to watch the race! A definite rush as the BIC fills up with thousands! 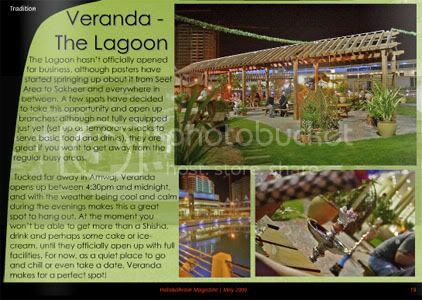 - Veranda at the Lagoon: Looking for a new place to chill? The Veranda at the Amwaj Lagoon is it! Quiet and brand new, it hasn't been completely discovered yet, and is a great spot to hang out! 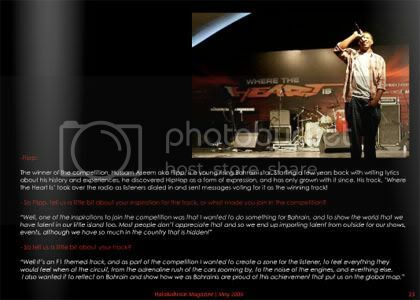 - Where the Heart is: In preparation for the Bahrain F1 Race, the BIC and Bahrain Talent have come up with a unique competition, getting local talents to produce F1 themed songs for the race! The winner gets their song played over radio, and get to perform it for global crowds at the race itself! 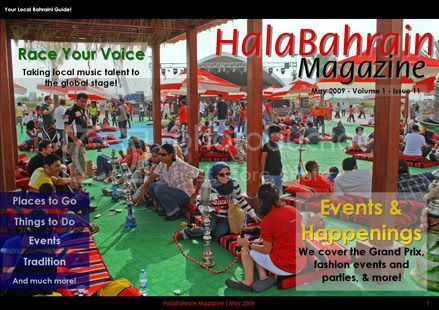 - Also in this issue: F1 after-parties; Heels and Wheels, FTV, and more! Omid Djalili stand up comedy, rock concerts canceled over funny t-shirts (yes, we're serious), and more!